24 has always been a show about action and reaction. Jack Bauer, of course, is the man of action, chasing terrorists and torturing people to get what he wants and save the day. Sometimes, though, he’s the man of reaction, tortured by someone else until – yes – he’s driven to action again, torturing more people to vengeance and save the day. 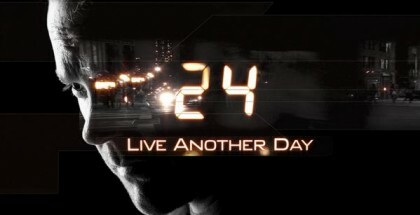 Episode 5 of 24: Live Another Day changes that. After breaking into the US embassy, Jack is arrested by the CIA and held in custody. He demands to talk to President Heller – a request that sees Bauer stuck sitting in a chair while everyone else moves around. It’s a rare moment of stillness for Kiefer Sutherland, who usually expresses himself by shouting and shooting at everyone in sight – and that shift shows, leaving Jack’s usual attempts at ridiculous ultimatums feeling even more ridiculous than normal. Fortunately, there’s someone else to keep the momentum going: Kate, aka Jack Bauer 2.0. Jackie Bauer. Uploading the contents of the flight key to Open Cell, she ends up being the one who goes rogue, who breaks the rules. 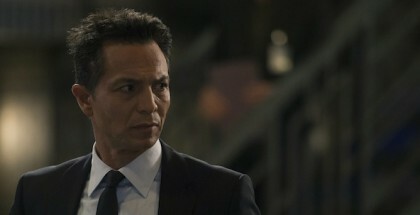 When Jackie Bauer’s boss (Benjamin Bratt) locks her out of the investigation, she’s the one on the phone to Chloe trying to solve the mystery of the hijacked drone behind the CIA’s back. Yvonne Strahovski does the job well as she plays off against Mary Lynn Rajskub’s conflicted hacker, each excelling in 24’s required ability to talk very quickly and look very serious while doing it. Chloe, meanwhile, is the most active in her activist cell, up against Michael Wincott’s Adrian Cross, who refuses to do anything to help the authorities. Their back-and-forths occasionally smack of forced confrontation – they stop short of using the word “Wikileaks” – but any contrivance is balanced out by the other big exchange: between Audrey and Jack. The show has been building up to the couple’s reunion, one that carries all kinds of nonsensical back-story. After Jack saved her husband’s life, then effectively killed him anyway before effectively getting her kidnapped by angry Chinese terrorists for years and, later, helping her to rehabilitate, how is meant to react to seeing her? By grabbing her head in his hands, apparently, and staring intensely – an expression that’s part anger, part something else rather unsettling. Kim Raver’s Audrey, though, is more comfortable with being restrained; fighting out from underneath her domineering, lying husband, she’s moving from a passive to active role in the series, expressing a whole range of emotions with just her quivering face. Thanks to her, Jack and Audrey’s meeting is as believable and moving as 24 gets. The rest of the hour’s action comes from the villain camp, another situation defined by doers and watchers. As Catelyn Stark orders Ian to pilot the drones, Naveed finds himself irrelevant – a dangerous place for any bad guy to be in. Where previously the assertive Cat Stark used Simone to provoke a reaction from the doubtful henchman, here the dynamic is transformed: Cat relies on Simone to be inactive instead. As she threatens to bump Naveed off, his wife’s cold response delivers the first big blow of the season – the price for failing to be active. Kate’s actions to prevent a trap, Jack’s inability to do something, Cat’s determination to anything. Episode 5 of Live Another Day reminds you just how much of an impact a character’s choice to act or react can have. With Bauer for once not the driving force of the show, the programme suffers from the lack of Sutherland’s heroic stupidity, but also benefits from its willingness to try something new. As Jack promises the President a contact – an arms dealer – whom only he can persuade to cooperate despite years of agency questioning, this week’s hour leaves you with two questions: Who could this person be? Tony Almeida again? Heck, David Palmer? And, more importantly, will Jack get reinstated as an agent to go back to his old ways? For the first time this season, you hope not. Jack may not be great at being tied to a chair, but if the writers are brave enough to keep him out of play, this season could turn into something far more interesting. Not a Sky customer? You can watch 24: Live Another Day online in the UK on NOW TV with an Entertainment Pass for £6.99 a month. For more information or to sign up, hit the button below.